Rubber is a product of which the shape can be deformed under pressure, but it will return immediately to the original shape as soon as the pressure is taken away. A characteristic of Rubber is elasticity and therefore it is also called elastomers. The modulus of elasticity (Young’s modulus) varies when it is stretched and so consequently not constant. Some of the characteristics of the rubber, such as hardness (expressed in Shore), temperature-, oil- and ozone resistance, tear, inflammability, wear, etc…, can be changed by using other types of rubber or by adding all kinds of other substances such as sulphur, soot, oil, antioxidants, plasticizers, etc. The allowed measure tolerance is a percentage of the DIN ISO norm. Rubber can be classified to origin in natural rubber (extraction from rubber trees) and synthetic rubber (substances from the petrochemical industry). 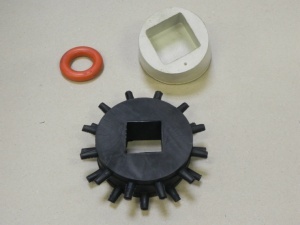 The use of rubber can be applied in various sectors such as construction-, automotive-, plumbing- and general industry.